Anne Belov has been drawing and painting since the time she could hold a crayon. After receiving a BFA from The Philadelphia College of Art, she moved west and, since she didn’t learn everything the first time, went to art school again, receiving an MFA in painting from the University of Washington. She now makes her home on Whidbey Island. Anne is the person behind the pandas of The Panda Chronicles (blog, four books and counting) and has recently released her first picture book, Pandamorphosis, a wordless adventure with pandas. There are, to her knowledge, no pandas in her backyard. 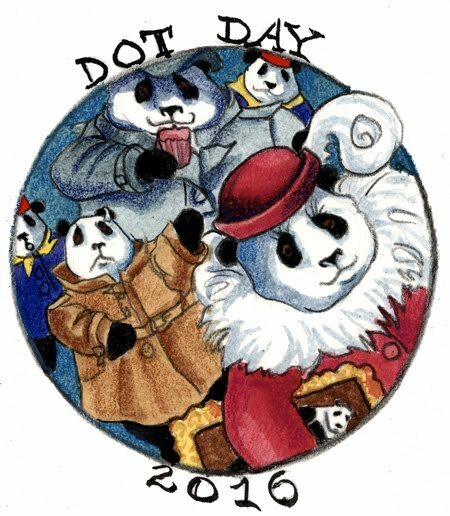 Her dot is inspired by her coming graphic novel, A Mystery with Art and Pandas!